Meetup is a wonderful thing. You can drop into a foreign city and connect with people that have similar interests as you. I’ve put a number of my Meetups back home on hold and joined new ones here ranging from photography, outdoors, to technology. Tonight was a hangout recreational group down south of town so I figured I’d stop in. Sometimes the Meetups you hit a home run, other times you’d go back there skeptical, and a few times you’re like no way. This one definitely dropped into the second bucket. I met some nice people there but the dynamic of the group wasn’t overly engaging. So, head up and camera out it was time to go explore Sydney. I enjoyed the photo walk this afternoon so I wanted to get back out and go exploring. It was just getting dark and I had a 3 mile walk through the center of town to get back home. The train station, Central is a unique photographic experiment all to itself. Trains from all over eastern Australia connect through Central. The train station must have 25 to 30 different tracks heading to different destinations. The sun was beginning to set which means I’m in my favorite moments of the day for photography. This building of expensive condos caught my eye as a reminded me of a very specific building in New York that I can’t think of the name of. The trees around it and its unique style really` my eye. Being in such a central part of town I’m sure the condos go for at least 1 million each. The last rays of sun cast such fun colors on the clouds across the horizon. The wide-angle lens did well to capture the broad shoulders of the clouds tonight. Sometimes you walk into a scene and have no idea how to capture it but you know something’s interesting about it. 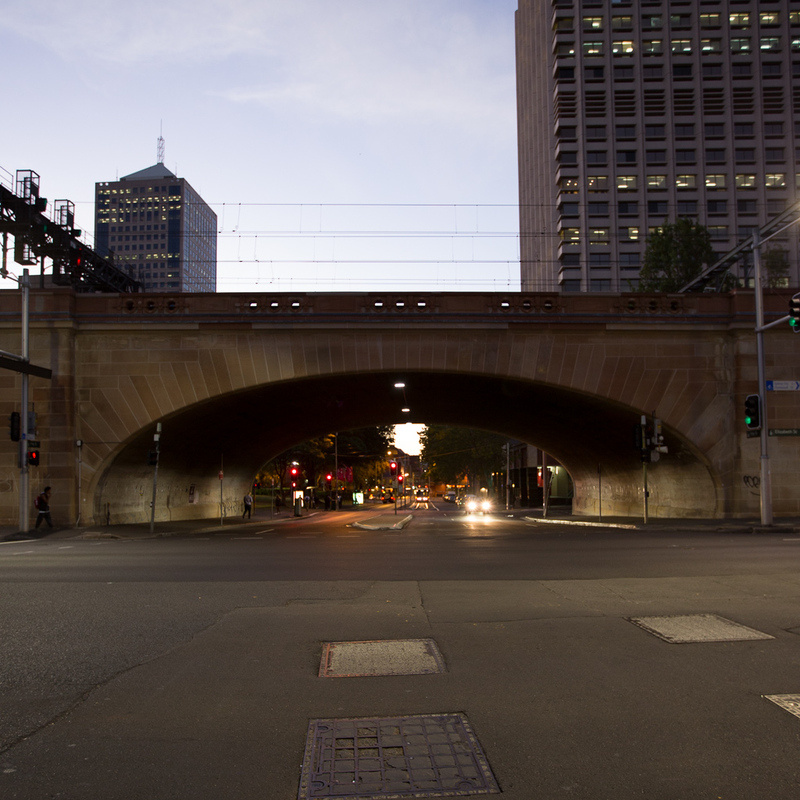 This bridge caught my eye as well as the traffic going all different directions. Streaking lights made the photograph too busy and the composition of it never fell into place. This one seemed to be the best of the bunch but falls well short of being good work. 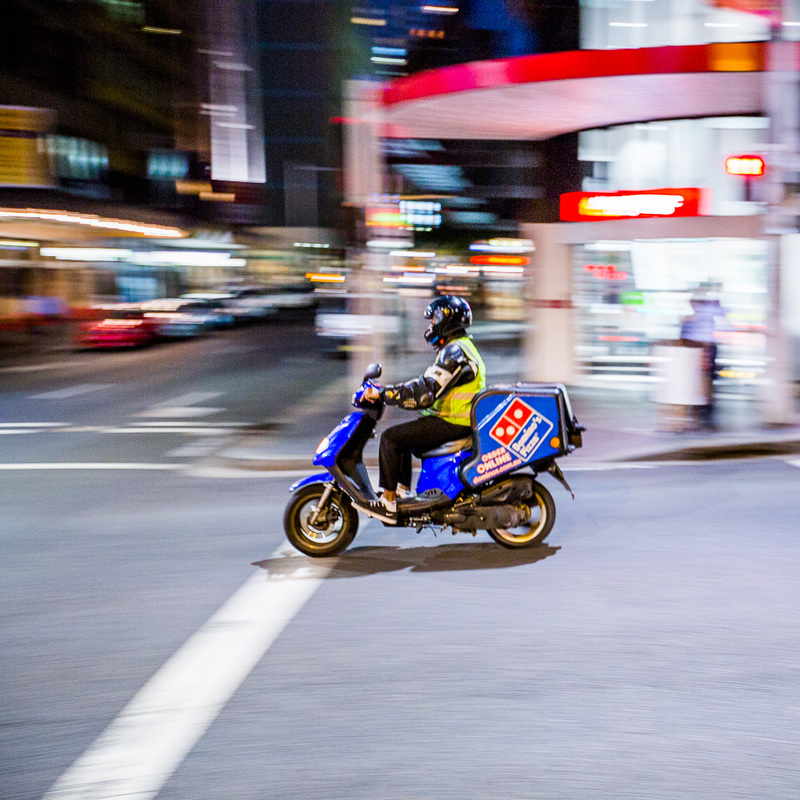 I saw a number of motor scooters around Asia delivering pizza. I was really surprised to see them here. Somehow I expected Australia to be more car dependent like North America. If I ever take up a career in pizza, it will definitely be here. Walking around you run into things you don’t normally see using a higher speed form of transportation. I was ambling up George Street (I think) and saw the fire station. I was instantly intrigued by The trucks (yes the little kid sometimes comes out in me). 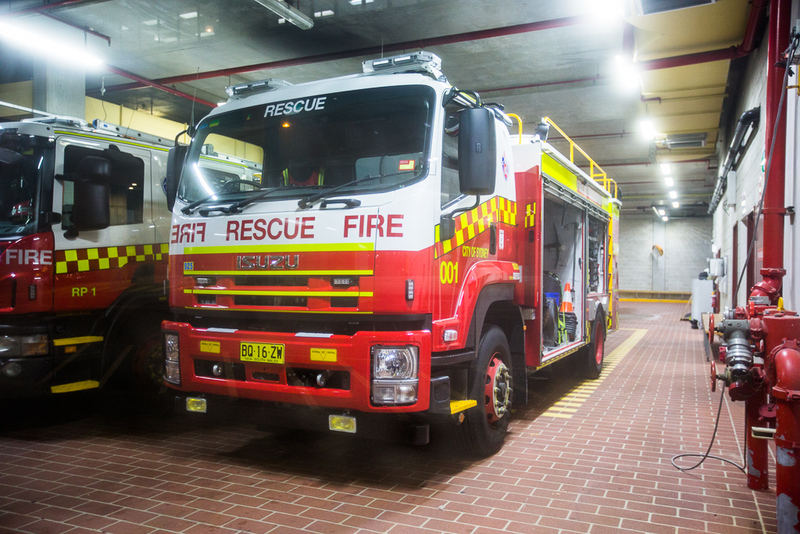 The firetrucks seem to have a more rounded European look than the boxy feel we have here in the States. 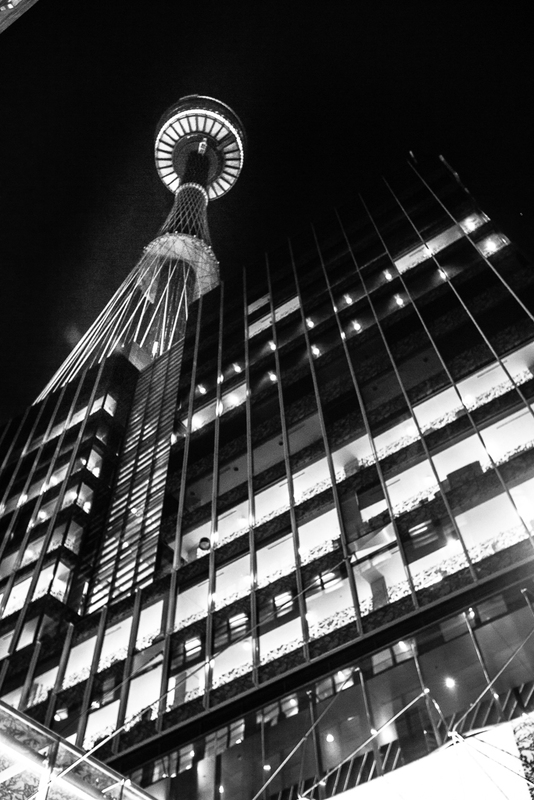 The Westfield Tower also known as Sydney’s Eye is a clear landmark in town. It’s definitely on my bucket list to go up and see the city from above. It’s much like the Westin Peachtree Plaza with the rotating restaurant and panoramic views of the city. I’m wondering now how much of the city you can truly see from the tower.. This is a public service announcement to help save the rhinoceros somewhere in the world. 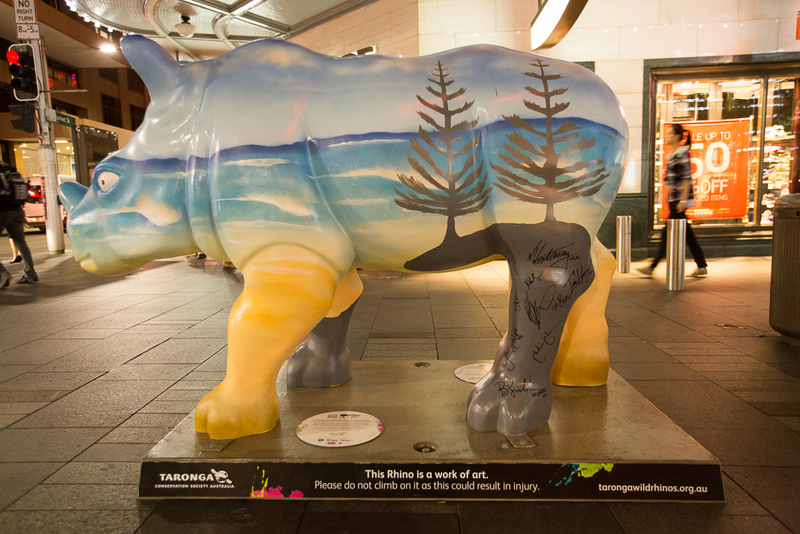 I keep running into the decorated rhinos all over town. 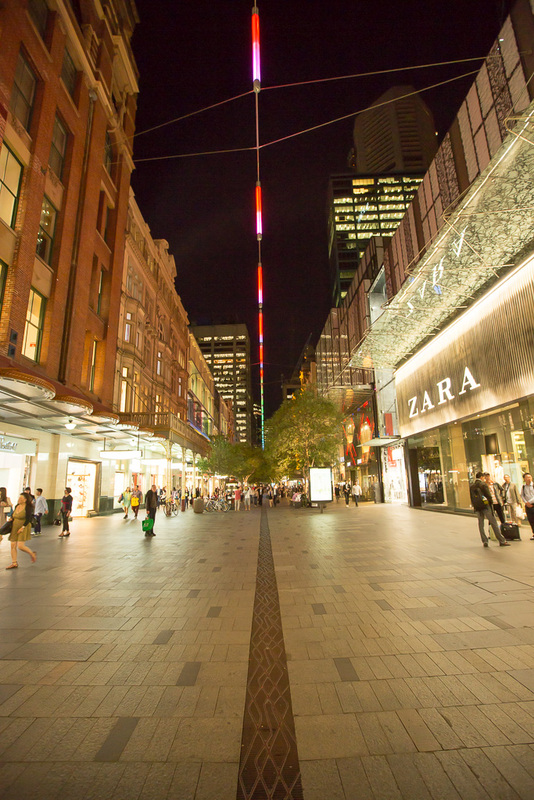 The Pitt Street Mall is an open-air mall in the heart of Sydney. It’s got all of the high-priced brands that one would expect in such a classy location. It’s always fun to walk through and people watch while you take in the evening. 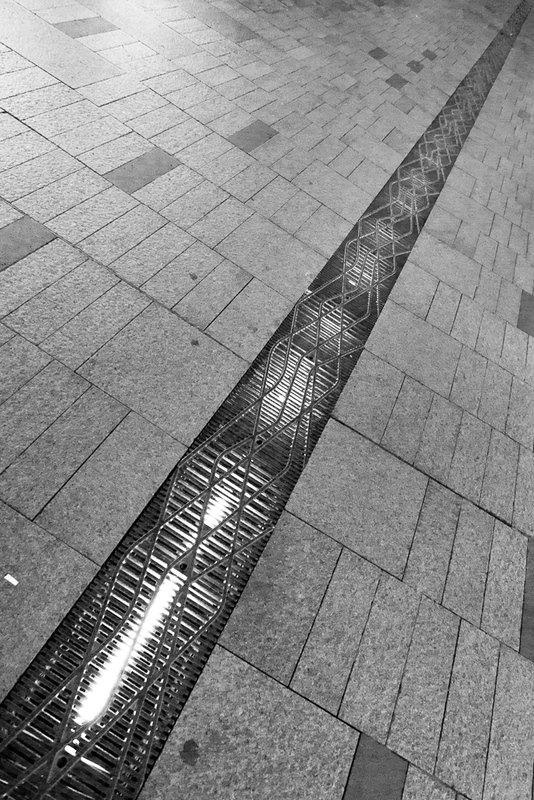 What intrigued me tonight about the mall was actually the drain. A drain you ask? This wasn’t your ordinary water funneling drain. It was a complementary beam of light that ran the length of the mall. It wasn’t until I put the photograph into black and white that I could see how it complemented the string of colored lights from above. 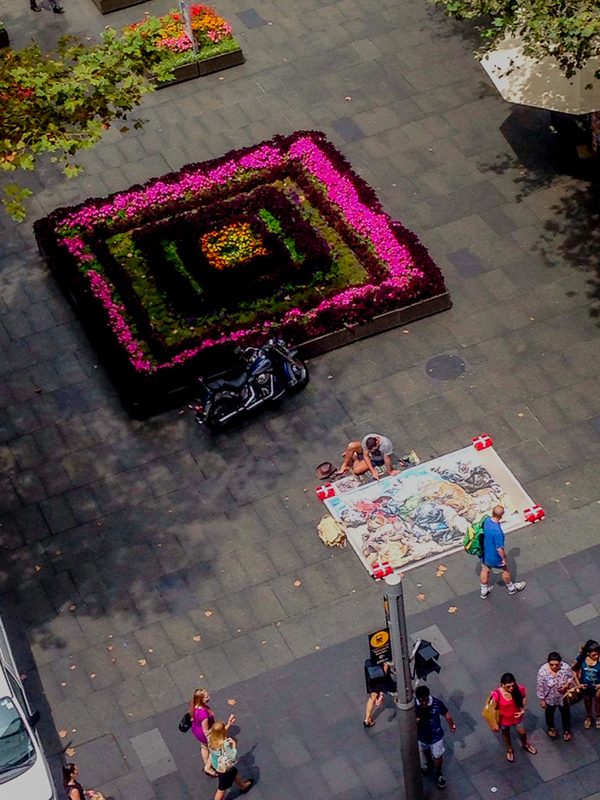 The Pitt Street Mall has all of the culture you’d expect in a major city’s gathering place: artists, musicians, the only thing that was missing were the street preachers telling me I was going to hell. One artist though, really caught my eye. He was doing a reproduction of Michelangelo’s The Creation of Adam. What medium was he doing it in? Colored pencil. Each area of the reproduction required multiple layers of colored pencil for such a high fidelity look. He was about two thirds the way done and 30 working days into the project. A few days later I saw another artist doing similar work near the office. Knowing what I know now, it’s painstaking work but the prints truly come out beautifully. 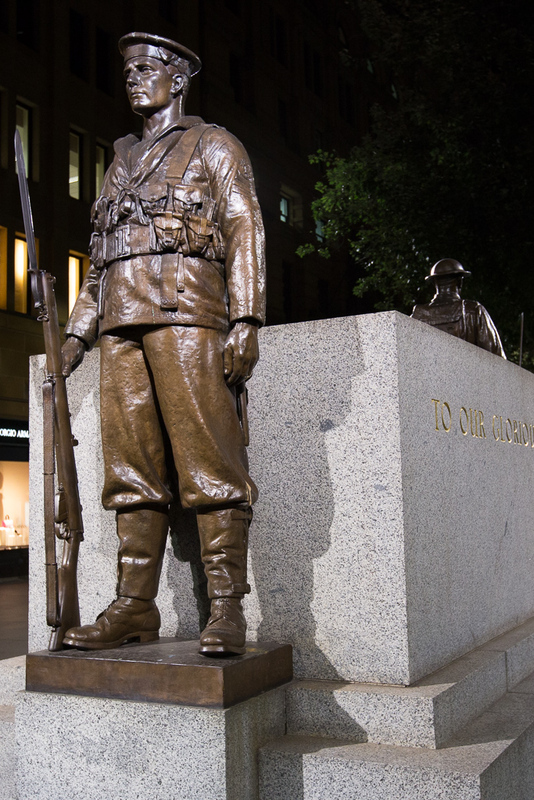 I wanted to circle back and see if I could get a better photograph of the war memorial near the office. 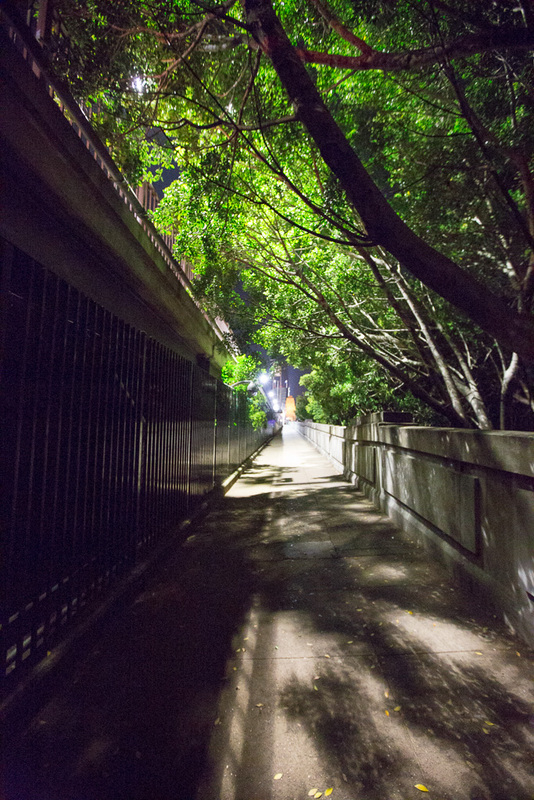 The lights were extraordinarily bright from the back, so I was limited on angles of approach. The full inscription reads: to our glorious dead. Other than the cemetery near Interstate 280 I can’t think of many war memorials back home. Maybe it’s the area of town or a difference in culture for a just need to move to Washington DC, but there definitely seems to be more of a focus on remembering the military than there ever was back in the Bay Area. Or, maybe I just live under a rock there. No trip to a foreign country is complete until there is a run-in with the law. 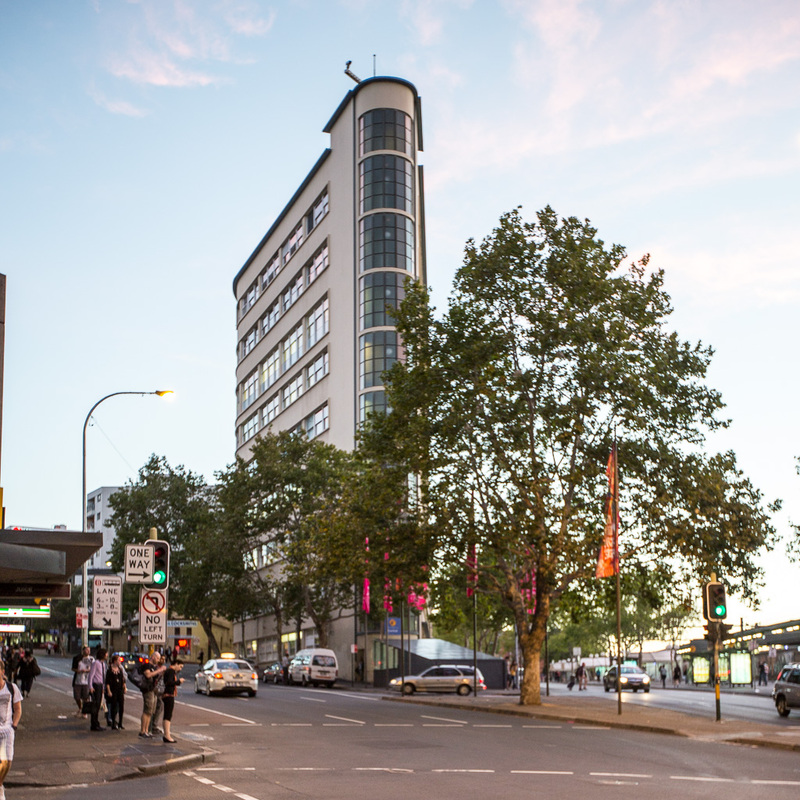 There were three motorcycle cops parked out in the breezeway ensuring that Australia’s populous was well behaved on a Thursday evening. The policeman was a truly nice guy. 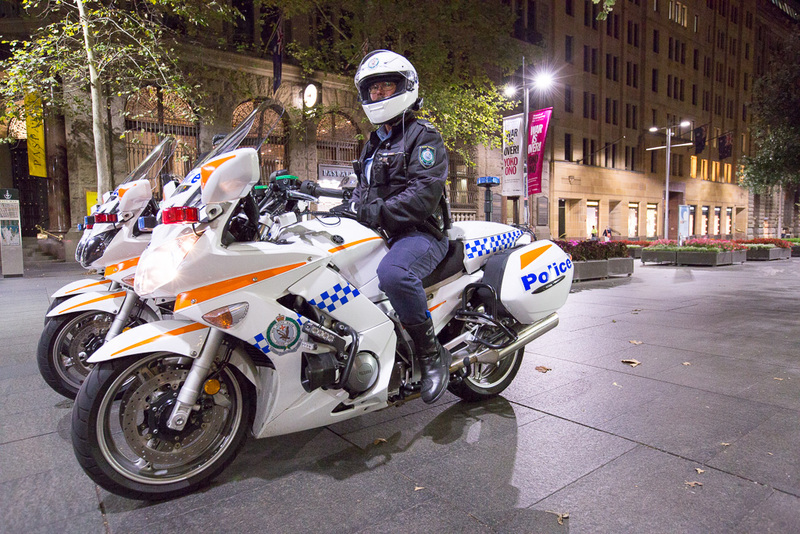 The Sydney Police Department has standardized on Yamaha’s FJR as the motorcycle of choice. when I rode one on the Coast and Volcanoes ride in 2010 I found the steering to be extremely heavy compared to my V-Strom. The police officer however really liked his bike and I know there are a number of happy FJR owners out there. It’s just not the bike for me! Right as I was walking over the bridge I saw a city of Sydney Ford Ranger parked on the side of the road. The Ford Rangers here look very different than their American counterparts. The Australian Rangers feel more like the American F-150 as it’s a beefier truck. Who knew? 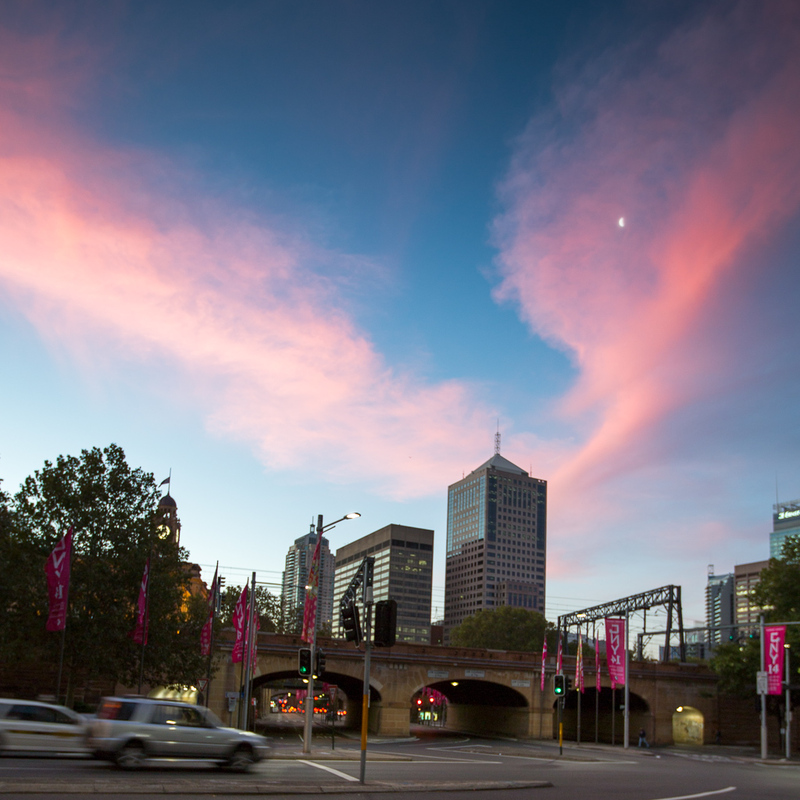 Sydney is the city of villages. I’m beginning to really enjoy the walk across the Sydney Harbor Bridge. When time permits it’s always a nice stroll across the bridge and seeing all the Sydney while being suspended in air. The approach still has the anticipation of the panoramic view ahead. I’ve become friends with one of the guards on the bridge. He’s in college and only has to work four days a week protecting one of Sydney’s “most recognizable landmarks” as he put it. One of the interesting things I’ve noticed on the bridge is the abundance of padlocks that appear. It turns out it’s a European thing that is migrated to Australia. People inscribe all sorts of things on their locks. Most of them tend to be messages like “Mike and Claire forever.” I often wonder how many of the couples are still together by the time the city brings out the bolt cutters and removes the locks. I was looking for one that I could relate to and found somebody giving thanks for the experience. I found it fitting for tonight. I can remember Brinda and I talking a late one night at work about the concept of urbanity. As a product of the neatly mowed, white picket fence lawns of suburbia and never really had an appreciation for urbanity. Brinda always referred to it as the benefit of living in high density situations and the plethora of experience that comes out of random encounters. 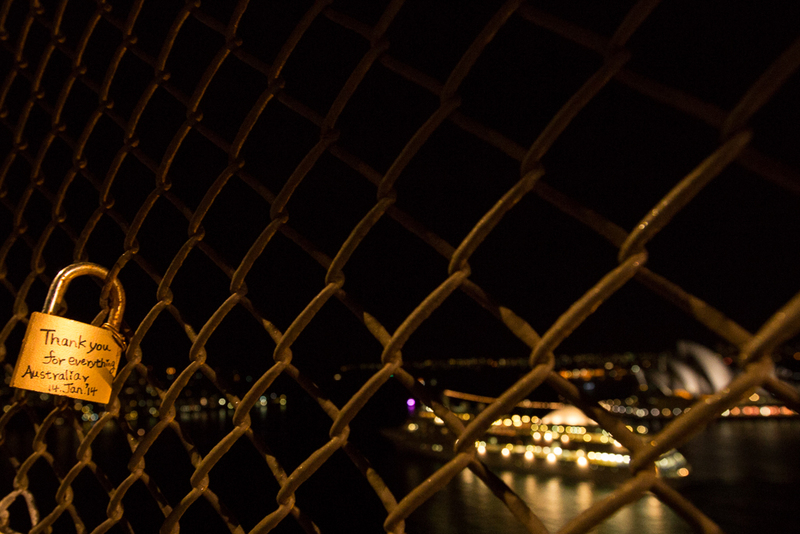 As I was walking across the bridge that night I saw someone taking a photo of the Sydney Opera House. A lot of me would normally just say keep walking but I stopped and said hello. It turns out his name is Marcus and he’s here on a visa stay much like I am but for a full year. We had a great conversation about photography and looking at some of the photos on his camera was inspiring. The idea for the lock and the Opera House above was Marcus’s. I however, wanted to take my own interpretation of it. 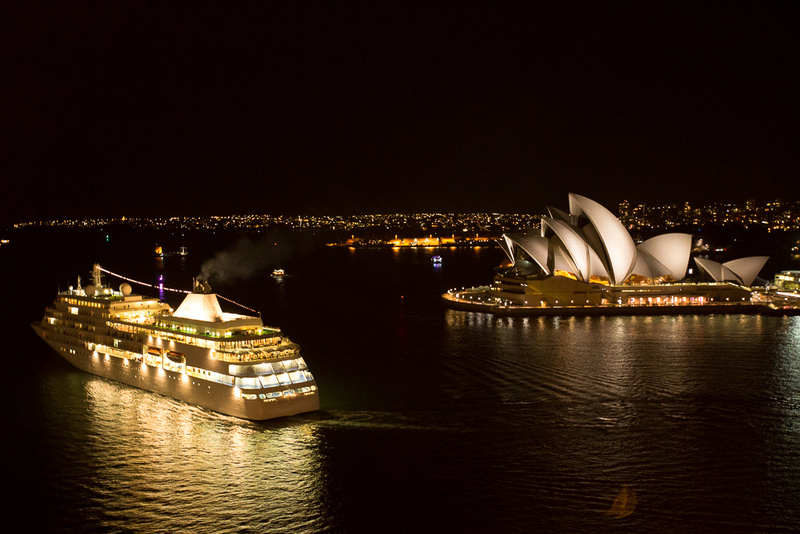 Sydney Harbour for as tight as it is has a lot of large cruise ships going in and out. Even after year, I’m still in love with taking photos of the Sydney Opera House. Something about that building truly speaks to me. Seeing a show there is also on the bucket list. Well folks, it’s getting late on this end. As my day is ending, yours will be just beginning. Cheers to your day! Flatiron!!!! There is one on peachtree too!